A slide is a perfect equipment for any playground. Children love slides! Each child has once taken speed to slide down, and definitely not only once. Some of us adults certainly, too. A slide is indispensable for a playground. It assumes an important role in imaginary stories: It could be the escape way when playing tag, the starting point for an obstacle course, the finish point of a race, etc. A slide is also a playground element which provides many benefits that are necessary during the early childhood development. Slides get children moving and foster an active life, removing the children from smartphones, tablet and computers. 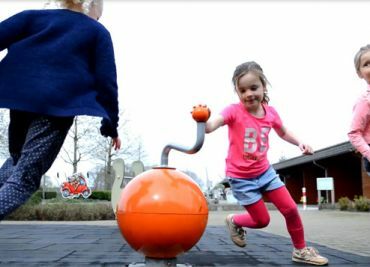 Playing with slides counteracts the sedentary lifestyle and the excess of weight, which are two problems more and more frequent already during childhood. Besides, slides foster the socialization as several children can play simultaneously. Slides facilitate the contact with other children while playing outdoors. Slides help to discover forms, colours and smells. Children get in contact with the nature, making feel them free even away from their comfort zone. A slide is a play facility which is perfect to stimulate the children’s balance, psychomotricity, coordination and reflexes. The children learn to understand their body, as playing with a slide helps them to get rid of the fear of falling and to know where are their limits. Playing with a slide strengthens the leg muscles and improves the spatial orientation. A slide is a great promotor of abilities and capabilities, amongst others as for imagination, strength, speed, ingenuity and creativity. Zoopark - Slide "The Snake"
Its structure and sliding sole made of stainless steel avoid that it corrodes due to rain or humidity. It has a free falling height of 130cm and needs a safety zone of 47,25m2. Zoopark-Slide “The Snake” is a playground structure consisting of three elements. The head of the snake is composed of an extra large slide with platform and stairs. The snake’s tongue is a curved sliding sole. 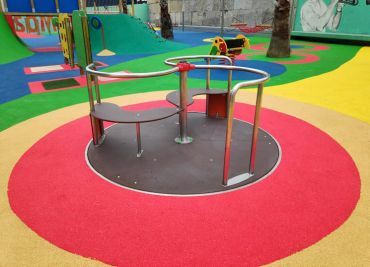 The other both elements which form part of “The Snake”,- the snake’s body and tail,- are playground elements where the children can climb and overcome obstacles. This slide is identical as the one before, however it consists of only one of the slide’s part, its head. Its safety area is reduced to 26,25m2. It’s a very large slide. The total dimensions of the snake’s head are 2,16 height and 3,93m length. Its free falling height is 1,30m. The big slide “Rampa”, just as “The Snake”, has a free falling height of 1,30m, whereas its safety area with only 24,50m2 is a bit smaller. The sliding sole is made of stainless steel. Thanks to the closed back panel of the stairs, the slide offers complete stability and a safe access. The slide is an exciting playground equipment for children who can experience with it the fun of taking speed and glide. This is the slide for younger children. It has a free falling height of 90cm and needs a safety area of 19m2. It offers complete stability and a safe access. This slide is conceived for toddlers and has a low free falling height of only 58cm. It’s ideally suited during early childhood when the children start to discover their body and its limits. 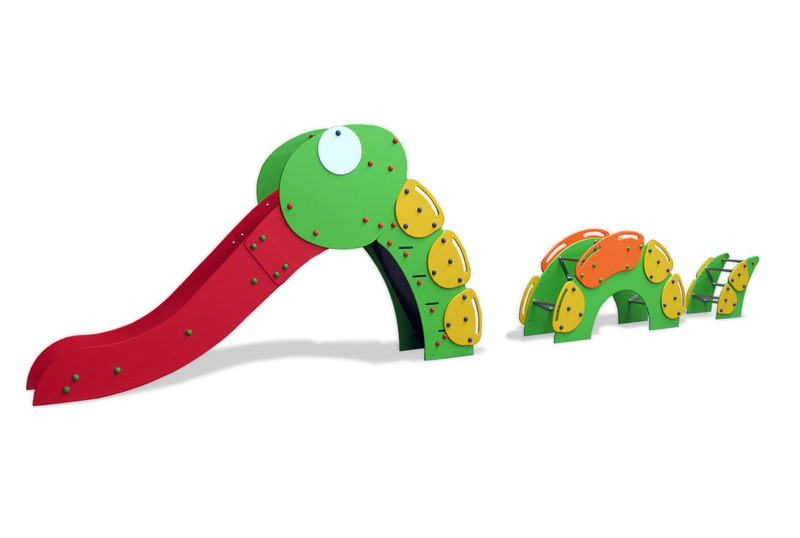 The slide depicts an adorable giant monster which will stimulate the children’s imagination. The access steps are of non-slip material surface. 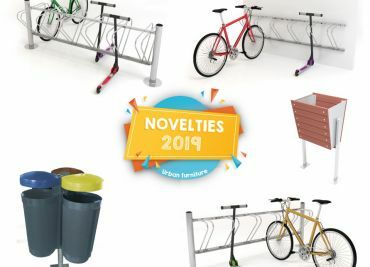 Due to its design and specific usage, it is optimal for crèches, nursery schools or public parks with a playing area for toddlers.